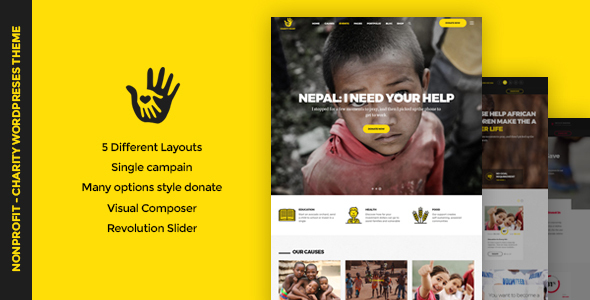 CharityHeart is a clean WordPress Charity Theme which fits for all kind of Charity, Single Charity, Fundraising, NonProfit, NGO and other non-profit charity projects website since it is a great theme that will make a model and professional website for all your needs. The theme includes a cool donation plugin, which lets you create causes, make donations (PayPal ready), and much more. CharityHeart theme support you many great tools to enable the features via using Theme Options, you also can customize Google fonts, Colors without code very easy and simple. Finally, every single element of in CharityHeart is entirely responsive, as content can be viewed from desktop and mobile devices. SAVE YOU $51 â€“ The WordPress theme includes the best selling slider plugin â€“ Slider Revolution (save you $18) and the amazing WordPress builder â€“ Visual Composer (save you $33).